Our newsprint Kraft paper shopping bags will set your retail packaging apart from the rest. 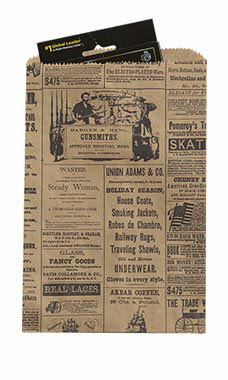 The newsprint bag features black printed early American advertising reproductions that will surely add a spark of nostalgia. A versatile product, this smaller size bag can be used in a variety of ways ranging from small gift items to wedding accessories and lingerie.